! Special Dior Event ! 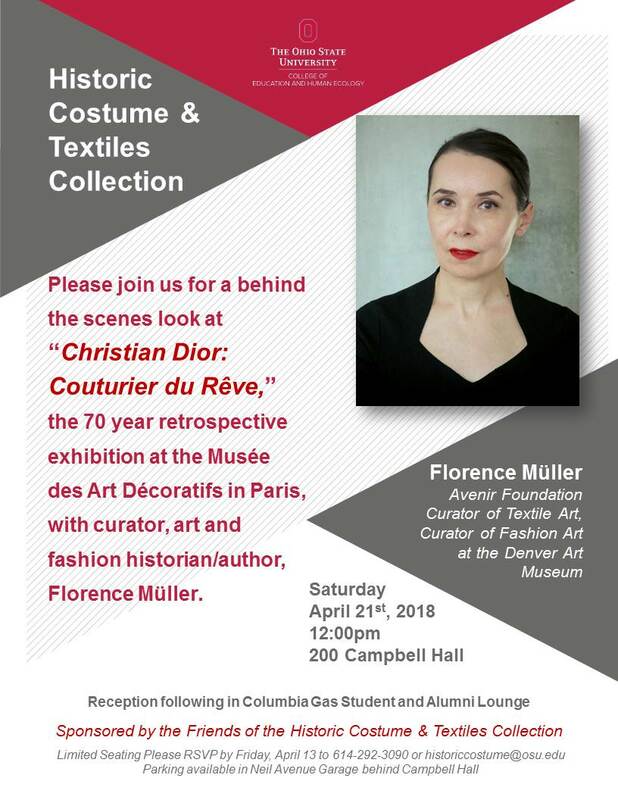 April 21, 2018, renowned Dior expert, Florence Muller will share her experiences putting together the 70 year anniversary retrospective exhibition, Christian Dior: Designer of Dreams, which opened at the Decorative Arts Museum in Paris last year. Ms Muller is a fashion historian and curator who has created over 100 exhibitions around the world, several of them with Dior as the subject matter. Recent fashion exhibitions include: Yves Saint Laurent: The Perfection of Style in 2017 at Virginia Museum of Fine Art, Richmond, and Shock Wave: Japanese Fashion designers 1980s-90s at the Denver Art Museum in 2016. 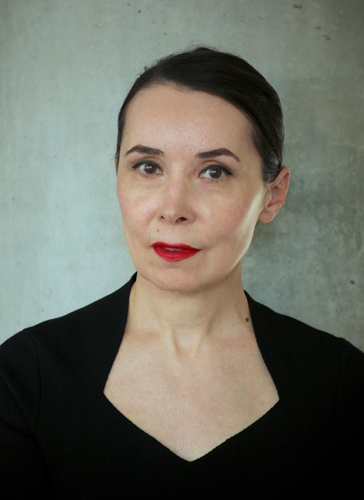 Since 2015, Ms Muller has been the Avenir Foundation Curator of Textile Art, Curator of Fashion at the Denver Art Museum. Before coming to the U.S. Ms Muller was Director and Curator of l’Union Française des Arts du Costume at the Musée des Arts de la Mode/UCAD, Paris. In Paris, she was also a professor in the Culture of Fashion program at the French Institute of Fashion. Between 2006 and 2015 she taught Luxury and Fashion theory at AMP, the Advanced Management Program in Fashion & Luxury, at the School of Economics and Management of Tsinghua University in Beijing. In France and Europe, she consulted for numerous various luxury brands and haute couture houses. She has published more than 30 books on the history of fashion. Please join us for an informative evening with Dr. Katherine Jellison, professor of history at Ohio University, who will share her research into the development of wedding culture in post-war America. 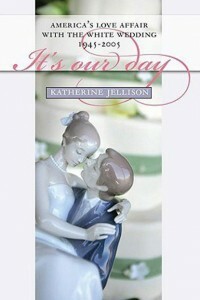 Dr. Jellison examines key influences that have sustained this culture for over 60 years; including the bridal wear industry, celebrity weddings, movie wed- dings and more. This lecture is given in conjunction with our current exhibition, “And the Bride Wore…Part II.” Light refreshments will be provided as well as the opportunity to tour the exhibition with Gayle Strege, curator. And the Bride wore… is the title of our next exhibition offering, opening September 17th with a Friends preview, of course. The exhibition will have two installations, one during Fall semester, and the second in Spring semester so we can maximize the number of dresses to display in our upper gallery space. In addition, the Global Gallery @ OSU student retail store is planning a Fair Trade wedding boutique in the lower gallery space to accompany our exhibition. The exhibition is organized around several themes, instead of being a strict timeline of wedding gown fashions, but will still feature dresses from the 1880s through the end of the 20th century and possibly into the 21st. All have interesting stories which accompany them. The themes include, “Something Old” and “Something New” which are pretty self-explanatory, “Something Borrowed”—a dress borrowed or re-cycled from a previous bride, “Something Blue”—a non-white wedding gown, “Generations”—more than one generation of brides in a family, “War Brides”—dresses worn around various war times, and “Local Interest”—dresses with stories and connections local to Columbus and Ohio. Each installation will feature 15-16 gowns and all thematic areas. Please contact us if you have questions about our exhibitions and programs.